First anniversary of the tragic death of Iona Institute researcher. “I would have to say it is no easier today than it was the day of Tom’s funeral and removal,” Fr John McNerney told the congregation gathered in West Dublin on Saturday for a Mass to mark the first anniversary of the tragic death of Tom O’Gorman. The 39-year-old former journalist and Iona Institute researcher was stabbed to death in his home in January 2014. Fr Stephen Kelly, who was friends with Tom, was the main celebrant for the Mass at Our Lady Mother of the Church, Castleknock on Saturday. The commemoration of Tom was attended by his younger brother and sister Paul and Catherine. The Iona Institute was represented by David Quinn, Breda O’Brien and Ben Conroy, and the Pro Life movement was represented by Cora Sherlock, who did a reading, and John Smith. Independent Senator Ronan Mullen also attended the Mass. Fr McNerney recalled attending a conference for over 500 priests from different parts of the world, including Syria, at which the Bishop of Aachen and noted theologian, Bishop Klaus Hemmerle (1929–1994) was recalled. Admitting that Tom would have often heard him speak about Bishop Hemmerle, Fr McNerney said that when he heard the Bishop being quoted at the conference he “immediately” thought of Tom. “Bishop Hemmerle shared in his talk how we so often have the experience of being near or beside God” such as feeling near God when in church. At Tom’s funeral last year, Fr Stephen Kelly admitted that the “shock and pain is hard to bear”. He said Tom cared so passionately for so many – he cared for people. The Chief concelebrant at the funeral Mass, Bishop Brendan Leahy of Limerick, recalled his first meeting with Tom in UCD in the 1990s. He said the Mass was to do three important things. 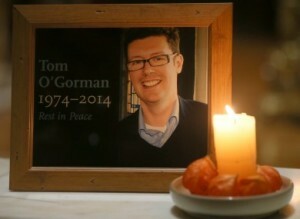 The eldest of three children, Tom had lived at the house in Castleknock suburb with his mother until she died in 2012. His father had died a number of years previously.